A Japan that might have been… revolutionary young samurai take on the West in this alternate history techno-fantasy set in 1850s Japan. In Japan of 1852, the peace imposed by the Tokugawa Shoguns has lasted 250 years. Peace has turned to stagnation, however, as the commoners grow impoverished and their lords restless. Swords rust. Martial values decay. Foreign barbarians circle the island nation’s closed borders like vultures, ever more demanding. 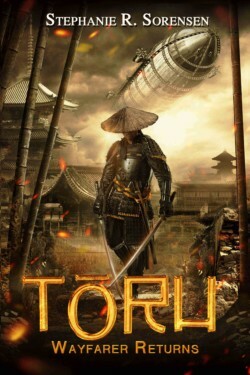 Toru, a shipwrecked fisherman rescued by traders and taken to America, defies the Shogun’s ban on returning to Japan, determined to save his homeland from foreign invasion. Can he rouse his countrymen in time? Or will the cruel Shogun execute all who set foot in Japan after traveling abroad? Armed only with his will, a few books, dirigible plans and dangerous ideas, Toru must transform the Emperor’s realm before the Black Ships come.